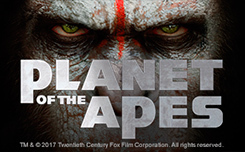 Company netent, announced release a new slot “planet of the apes”, which based eponymous film “The Dawn of the Planet of the Apes”. In new game, developers decided surprise their fans and equip gaming machine with 10 reels, which together give 40 game lines. Also, new slot Planet of the apes has 7 different bonus features and an additional multiplier. 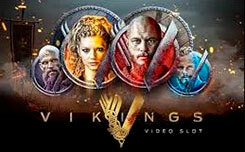 Design of the free slot completely corresponds trilogy, and any winning combination is accompanied by soundtrack from movie. Game reels there are pictures famous heroes, as well standard playing symbols 10, J, Q, K, A. 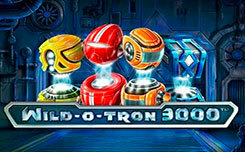 Wild function – activated when game drum is full in first game window, wild symbols are duplicated on second playing field, this function also has name Dawn Play, which allows you to get not three but six wild symbols. Rise Bonus – started when a symbol with same name (rise bonus) appears on one of game reels. In this function, all fallen expensive symbols will bring a random cash prize, which will increase your initial bet 80 times. Dawn Bonus – function is activated when Dawn bonus symbol appears. All symbols except 10, J, Q, K, A, are highlighted in yellow and turn into one of expensive symbols, which can bring up to 1,200x. Dual Bonus – activated randomly. In both game fields there appear symbols which in turn can not be the same, you will get a second rotation if you catch an identical symbol, it is transferred to the corresponding field, and you will get a second spin, the game will continue until the winning combinations match. Rise Free Spins – activated only on first game field, you get 10 free spins, where each fallen wild symbol can be added with a repeated rotation. 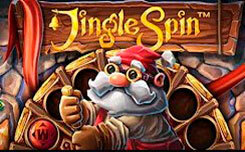 Dawn Free Spins – activated only on second game field, in this mode you need to collect appropriate symbols, which can add an additional multiplier, an additional wild or several repeated rotations. 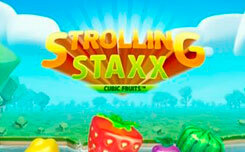 Multiple Free Spins – starts with simultaneous activation of rise free spins and dawn free spins. 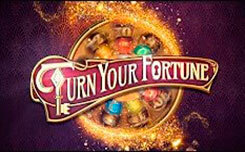 You will receive two wonderful bonuses at once, which will be activated, in the order in which they fell out.